Nine in ten Americans say economic conditions in the U.S. are poor. NEW YORK (CNNMoney) -- Three years after a financial crisis pushed the country deep into recession, an overwhelming number of Americans -- 90% -- say that economic conditions remain poor. For a White House now fully engaged in re-election efforts, there is one shred of good news: More than two and half years after inauguration day, Americans are still more likely to blame former President George W. Bush for current economic conditions. Asked which administration is to blame, 52% of Americans blame the previous Republican regime, while only 32% point a finger at Obama and Democrats. While there is widespread consensus that the economy is in rough shape, Americans have a split opinion of two of its biggest actors: Federal Reserve Chairman Ben Bernanke and billionaire investor Warren Buffett. Bernanke -- who leads monetary policy for the world's largest economy -- is relatively unknown. Only 42% of Americans have an opinion of the Fed chief. Meanwhile, those with an opinion are roughly split between positive and negative views. Republicans are less enthused with the Fed chairman than Democrats. Only 25% have a favorable opinion of Bernanke -- a Republican who was appointed by George W. Bush and reappointed by Obama. Both Bernanke and the Fed have become targets for criticism by most of the 2012 Republican presidential candidates, particularly Texas Gov. Rick Perry. Buffett, meanwhile, is more well known and more popular. Forty-three percent of Americans have a favorable opinion of the Berkshire Hathaway (BRKA, Fortune 500) chairman, while 33% are unsure and 24% hold an unfavorable opinion. Buffett has been more outspoken in his support of Obama in recent months -- even holding a fundraiser in Manhattan. As with Bernanke, Buffett enjoys a higher favorable rating with Democrats -- 47% of whom approve, while only 36% of Republicans give the same answer. 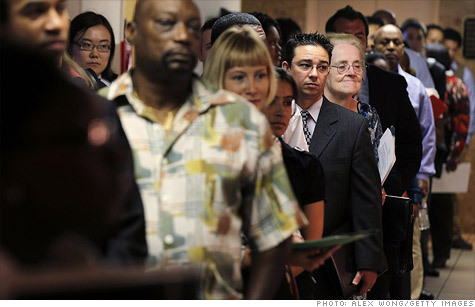 How can Obama solve long-term unemployment?